Feb. 21, 2019, © Leeham News: Airbus is boosting the A320 production to 60/mo this year and 63/mo next year. But it’s put a pause on increasing the A350 rate from 10/mo to 13/mo. Boeing was widely expected to follow its planned 737 rate hike of 57/mo, from this summer, to 63/mo next year to keep up with demand and with Airbus. However, on the sidelines of the annual Pacific Northwest Aerospace Alliance conference last week, LNA learned that a 737 rate hike to 63/mo has been apparently put on a pause. Although Boeing has not made a decision to go to rate 63, the hike was expected in 2021, according to suppliers. This is now showing as 2022, they said. Airbus, Boeing backlog for single-aisle airplanes extends years. Both have ramped up production to meet demand, create delivery positions. Supply chain struggles to keep up. Twin-aisle demand waits for replacement surge. February 14, 2019, ©. Leeham News: Airbus announced its 2018 results today at a press conference in Toulouse. It was the last Yearly press conference for Airbus CEO Tom Enders and CFO Harald Wilhelm. Both leave the company in the coming months. 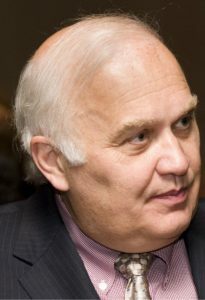 The press conference was colored by the CEO hand over to Guillaume Faury but also the winding up of the A380 program, a problem Enders didn’t want his successor to inherit. The gone year delivered overall results as guided a year ago despite closures charges for A380 and further provisions for A400M. Feb. 13, 2019, © Leeham News: Airbus announced today (Seattle time, Feb. 14 in Toulouse) that it is terminating the A380 program. The last airplane will roll off the assembly line in 2021, for Emirates Airlines. 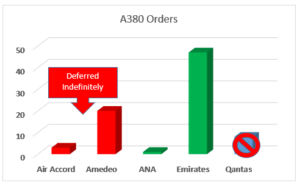 Emirates cancelled an order for 39 A380s. In its place, the carrier ordered 30 A350s and 40 A330neos. 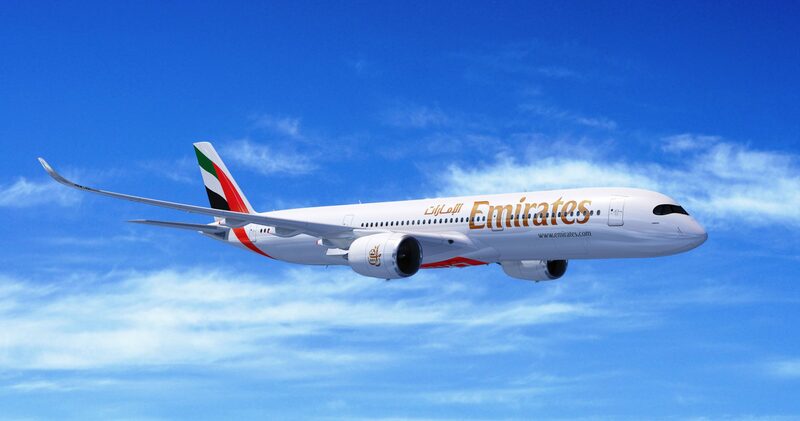 The Emirates and Airbus press release is here. Airbus A380’s future in doubt. Photo: Airbus. 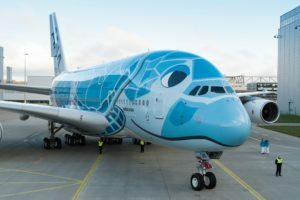 Feb. 11, 2019, © Leeham News: Terminating the A380 program may be a blessing in disguise for Airbus, writes a US aerospace analyst. At the same time, it could cause headaches for the supply chain. Carter Copeland of Melius Research LLC makes a split decision on the future of the A380. There is speculation that retiring Airbus CEO Tom Enders might decide to end the program before he leaves office in April, clearing the decks for his successor, Guillaume Faury. Jan. 2, 2019, © Leeham News: Boeing dominated the Top 10 news stories last year, as measured by views. Displacing Airbus at Hawaiian Airlines, which ordered the 787-9 and canceled the A330-800, led the readership. Boeing’s flip of the Hawaiian Airlines order for the A330-800 to the 787-9 was the most read story of 2018. Photo: Hawaiian Airlines. Airbus’ launch of the A350-900ULR came in second. Dec. 21, 2018, © Leeham News: It is a stretch to say 2019 is a pivotal year for Boeing. There would have to be events of tsunami proportions to be pivotal for a company with revenues of more than $90bn. But there is no doubt 2019 will be a very important year for Boeing. The headline to watch will be the widely anticipated launch of the New Midmarket Aircraft, also called the 797. The 777X begins flight testing next year. Sales are stalled for the newest airplane of the Boeing family. The proposed new joint venture between Boeing and Embraer is expected to be consummated by the end of the year. December 19, 2018, © Leeham News. : Next year is a time when Airbus hopes to leave its troubled 2018 behind. But 2018 was also when the company wanted to leave the troubles of 2017 behind it. Not only did 2018 not improve. In a number of ways it turned worse. Engineless A320neos at Toulouse Airport. Airbus hopes this is a thing of the past. Photo via Google images. Turmoil in the management ranks brought back memories of the politically infested Airbus of 20 years ago. And there were other issues. Production problems with the A320 continued. The A330neo was further delayed and the A380 order from Emirates to save the program took forever to materialize. The negotiations to fix the contracts for A400M couldn’t be brought to a close. There were two bright lights in the year. The A350 was now out of its cabin supplier problems and delivering aircraft to plan. The other was the gift from Boeing’s suing Bombardier and its CSeries the year before. The top modern Bombardier CS100/300 became Airbus A220 on the first of July. Price tag; $1 for 50.01% of the program. Changes in executives are almost over. Pratt & Whitney’s engine delivery delays are caught up and CFM’s delays are diminishing. Production ramp ups are peaking (for now) and deliveries should be at a record rate next year. Airbus is waiting for Boeing to decide whether to launch the New Midmarket Aircraft. Is the A380 less economical than a 777-300ER? December 06, 2018, © Leeham News. 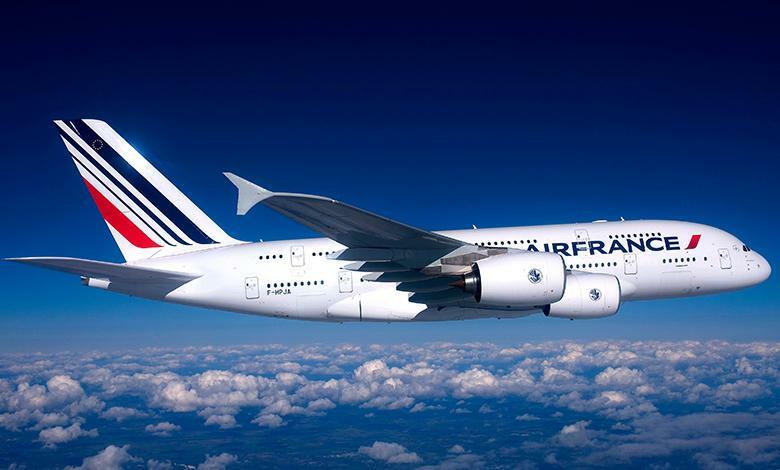 : Our Monday article “A380 suffers new blow, future remains bleak” describes how Air France hands back five of their 10 Airbus A380-800 to their lessor with start next year. The article details the reasons behind the returns. Other media writes the A380 are notably more expensive to run than a Boeing 777-300ER. As so often, this is a serious case of apples and oranges. To compare aircraft like-for-like, they need to be compared with the same rules for cabins and operations. When this is done, the A380 is not more expensive to operate than a 777-300ER. The caveat is: if filled to the same load factor.